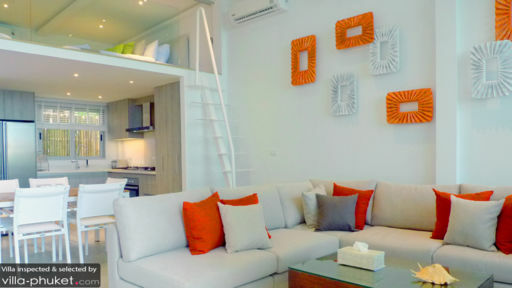 Just as its name suggest, The Beach House, located in the heart of Ao Yon Bay, offers the best of beachfront living. Enjoy views out to the coast each and every day, as well as calm waters all year round (ideal for vacationers who can’t resist a daily swim in the sea!). The Beach House also serves as a great base to explore the best attractions in town. Phuket Town, with its chic bars, restaurants, designer shops and colourful markets, is located a 15-minute drive away. 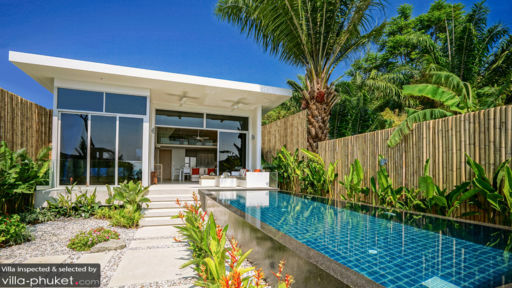 You’re 15 minutes away from the main shopping centres and night markets of the island, and just a stone’s throw away from Cape Panwa - where you’ll find The Phuket Aquarium, along with an array of bars and restaurants. Beach lovers will adore spending the day chilling out at Ao Yon beach and enjoying its beachfront dining and drinking establishments. Three finely appointed bedrooms comfortably accommodates groups of six to eight guests. Your options include two double bedrooms, as well as a mezzanine bedroom overlooking the living area. The latter sleeps two adults or four children. Neatly manicured and picturesque, the grounds of The Beach House are just what you’d expect of a holiday home set in the tropics. Emerald foliage frames a garden containing pool with sunken seats, bar and barbecue area and a lawn fitted with loungers. Guests enjoy direct access to the beach and sea from the garden. Walls of glass offer uninterrupted vistas of the sea, and create interiors that are bathed in sunlight. Enjoy a sense of spaciousness in the cosy lounge, which extends out to include a dining area. Meals are prepared in a well-equipped kitchen, and are enjoyed indoors or outside by the poolside terrace. The Beach House is a full-service property with housekeeping services, personal guest services, laundry service and security service. Amenities available at additional cost include in-villa massages, personal chef services and airport transfers. A baby cot and child-minding services are available at extra cost. The Beach House is located in Cape Panwa. Located in the southeastern region of Phuket, Cape Panwa is removed from the bustle and tourist crowds along the western coasts. It’s tranquil and scenic, and will suit villa vacationers looking to take it slow during their holiday. From your villa, you’re just a skip away to Ao Yon Beach. Set in a tucked-away location, the beach is quiet and remote, and boasts fine white sand, sparkling waters and a palm-fringed coast. Panwa Beach, located about six minutes’ drive away is just as picturesque. It’s ideal for relaxed beach strolls accompanied by views out to Chalong Bay and Lone Island. The area doesn’t offer much in terms of travel activities or attractions - but this will suit holidaymakers seeking a laidback getaway. Visit the spa at Cape Panwa Hotel, or try out the incredible Thai hammam at Amatara Wellness Resort, where you’ll choose from a range of Thai and Turkish hammam treatments. Bask in nature’s glory at Ao Yon Waterfall, or visit offshore attractions like Coral Island or Lone Island. Both attractions are just a 15-minute speedboat ride from Cape Panwa. Stop by Phuket Town’s weekend markets to experience the local shopping scene, and stay on later if you wish to savour its vibrant nightlife scene. There are night clubs, jazz hangouts, ladyboy cabaret performances, cinemas, bowling alleys and more! When you’re not enjoying an in-villa dining experience at The Beach House, try out venues like The Cove Phuket, Top of the Reef, Live India Indian Restaurant and Panwa House Phuket. Looking for a lively hangout to sip sundowners? Our favourite spot is the aptly named Sunset Bar. Enjoy!